"Neither shalt thou take a wife to her sister, to vex her, to uncover her nakedness, beside the other in her life time." "Careful estimates put the number between 30 and 40." "And if a man take a wife and her mother, it is wickedness: they shall be burnt with fire, both he and they; that there be no wickedness among you." 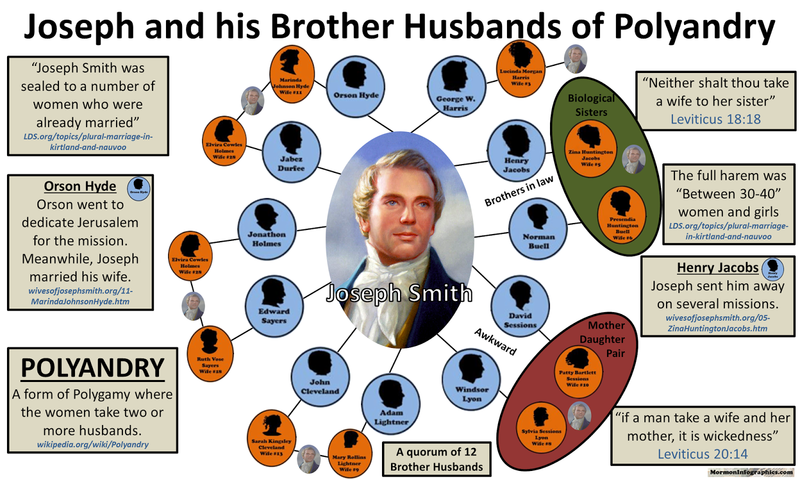 "Joseph Smith was sealed to a number of women who were already married." "No tomarás esposa juntamente con su hermana, para hacerla su rival, descubriendo su desnudez delante de ella mientras esta viva." "Las estimaciones minuciosas calculan que fueron entre 30 y 40." "Y el que tome como esposas a una mujer y a la madre de ella comete vileza; quemarán en el fuego a él y a ellas para que no haya vileza entre vosotros." "José Smith se selló a varias mujeres que ya estaban casadas"
The babies of mormon gays may not be blessed.